In a passionate and well-articulated guide that puts to rest the idea that dyslexic people are unintelligent, disabilities advocate Foss (himself dyslexic and the creator of Intel Reader, a text-to-speech device) describes dyslexia as a characteristic and a disability that should be accommodated in the same way as blindness or mobility issues. Foss reframes the use of film, audiobooks, and material read aloud as ear-reading, in contrast to the eye-reading that is the educational standard. Though, as Foss notes, eye-reading is a useful skill that can be improved by teaching methods like Orton-Gillingham, by mid-elementary school, dyslexic students should be accommodated with auditory materials. He hopes that parents can learn to explain their child s needs in a way that will win them essential support, and that they can help their child build self-esteem. Foss describes the current state of assistive technology and highlights the availability of material from resources like Learning Ally; he also discusses how to navigate good accommodations in the school environment and determine if a school is inappropriate for your child s welfare. This extremely practical and motivational book will be welcomed by parents of dyslexic children. I've worked in the field of learning disabilities education for fourteen years, and this is the first book I've read on dyslexia that provides a roadmap for parents to help empower their children. It is the book I wish I had copies to give to every parent who walks through my door, who has recently learned that their child is dyslexic or that their school is failing them. 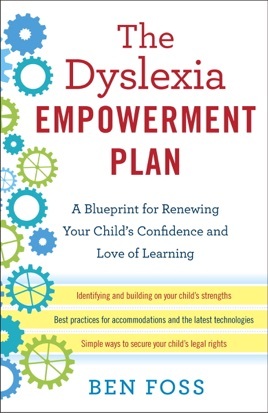 While components like research, science, and stories of success are woven throughout the book, Foss' main objective is to help parents build a plan for their child, which includes identifying strengths, navigating the school system and legal rights, how to integrate accommodations, including assistive technologies, and, perhaps most importantly, how to talk with their child about their dyslexia. Why is this so meaningful? Most texts on dyslexia provide background; this book provides a path. It's the "What to Expect When You're Expecting" for the parent of a dyslexic child, and it's accurate, meaningful, and sincere because Foss himself was identified with dyslexia at age eight. Dyslexia is a hidden disability, not just because it can't be seen, but also because many dyslexics, including the author for many years of his life, try to hide it. Embarrassment, shame, guilt, and stigma are all components of why people hide their learning disability. Foss provides great stories, analogies, and actionable steps that steer people away from looking at dyslexia as a disease. As Foss says, "there is no cure because there is no disease." Tools, like the strength profiles map, allow parents, and dyslexics themselves, to begin building a plan for how to leverage their strengths and create an environment in which they will be succesful. There are also form letters and templates, like those to help parents navigate the IEP and legal processes, and numerous resources, both in the book and referenced on the web, that will help parents and their children immediately. There are several great books on dyslexia, but if you are a parent of a child identified with a learning disability, or you even think s/he may have a learning disability, this is THE FIRST book I would recommend reading. Foss teaches dyslexics how to integrate their dyslexia, which is the most important component of all. A Complete, Practical Guide to Understanding Dyslexia - Best (& Perhaps First) in Its Class! In his book, The Dyslexia Empowerment Plan, Ben Foss does many things really well. He describes what it was like growing up with dyslexia and how he learned to accept it as part of who he is, all with a sense of humor that makes his story relatable to his readers. He lets dyslexics and their families know that they are part of a vibrant community known as The Nation of Dyslexia, in which the unique skills of the dyslexic brain are to be prized and celebrated. He does an excellent job introducing how assistive technology can level the playing field for dyslexics, and how it can be paired with Orton-Gillingham instruction to give dyslexic students the best chance for success in school and beyond. He gives a clear, understandable explanation of the legal rights of dyslexic students and how parents can advocate for their children and get the accommodations to which they are entitled. Finally, he fills his book with practical ideas and valuable resources that promise to become part of the standard discussion on dyslexic education going forward. All told, Foss has written the most complete and readable book that I have read on this subject. Not only will this become an invaluable guide for all families coming to terms with dyslexia, it should become required reading for all teachers, as it will give them a comprehensive understanding of the dyslexic students they will all find in their classrooms.